On September 2, 2010, Barkley led the Trojans to an opening week victory at Hawaii by a score of 49–36. Barkley contributed five passing touchdowns (three to wide receiver Ronald Johnson) on 17-of-23 passing for 257 yards. The win marked a successful debut for new USC head coach Lane Kiffin and the first win under USC's 2010 NCAA probation and sanctions. Both teams amassed over 500 yards of total offense. Barkley said, "I'm just trying to be as perfect as I can be. Last week was pretty close, but that perfect game is kind of a goal and that's no completions." Coach Kiffin added, "We'll see if he can continue to do it again. Great quarterbacks put together good games every week." Matt Barkley continued a solid sophomore campaign. With notable performances against Stanford and Cal. Barkley sprained his ankle during a loss to Oregon State and was forced to the sideline for the Notre Dame game. He returned to lead the Trojans to a gutsy 28–14 victory over UCLA. Barkley began 2011 by setting the USC single-game record for completions with 34 against Minnesota. On October 1, against Arizona, he passed for a USC single-game record for 468 yards. On November 4, he passed for a USC single-game record for touchdowns in a game with 6, against the Colorado Buffaloes, one of the two additions to the Pac-12 in its inaugural season; the game was the first against Colorado since 2002. He had previously tied the single-game touchdown record three times, sharing it with Rodney Peete, Carson Palmer, Matt Leinart and Mark Sanchez. On November 26, against the UCLA Bruins, he tied the single-game touchdown record again in a 50–0 shutout of the Bruins. On national television Barkley stated the best moment of the UCLA game was his pass to his cousin Robbie Boyer. Over the 2011 season, Barkley accumulated 39 touchdowns, an all-time Pac-12 record, and helped end the season with a 10–2 record. Barkley had the 6th most votes for the Heisman Trophy. He finished with a 39–7 touchdown-to-interception ratio while completing 69.1% of his passes. He won the 2011 CFPA National Performer of the Year Trophy with his record-breaking season. On December 22, 2011, at a press conference convened at Heritage Hall, Barkley announced he would return for his senior year with the USC Trojans rather than entering the 2012 NFL Draft. Barkley announced his return to USC in his own unique way by giving Coach Kiffin a homemade ornament for Christmas with a picture of them at the Colorado game, but on the back revealing the text "One more year." Barkley has described his decision to stay at University of Southern California in his senior as "unfinished business", as he wanted to be part of a team that would be aiming for the BCS championship after a two-year postseason ban. The Philadelphia Eagles selected Barkley in the fourth round (98th overall) of the 2013 NFL Draft. Going into training camp, it was announced that he would be given a chance to compete for the starting quarterback job, facing off against the two starting quarterbacks from the previous season, Nick Foles and Michael Vick. On October 20, 2013, he saw his first NFL action against the Dallas Cowboys as he came into relief for Nick Foles, who left early in the fourth quarter due to a head injury. In that game, Barkley completed 11 of his 20 pass attempts for 129 yards and threw 3 interceptions. Barkley's second game came the following week in relief of Foles (concussion) and Vick (quadriceps) on October 27 versus the New York Giants. Barkley completed 17 of 26 passes for 158 yards, no touchdowns, one interception, and one fumble inside their red zone. On October 31, 2018, Barkley was signed by the Buffalo Bills. On November 11, it was announced that he would start for the Bills against the New York Jets over Nathan Peterman with starter Josh Allen injured. Barkley, making his first NFL start in two years, threw for 232 yards and two touchdown passes as Buffalo beat the Jets 41–10, snapping the team's four-game losing streak. On December 21, 2018, Barkley signed a two-year contract extension with the Bills through the 2020 season. ^ a b Evans, Thayer (February 11, 2008). "Coveted Quarterback Looks to Thrive on Next Level". New York Times. Retrieved February 23, 2008. ^ Maya, Adam (July 16, 2008). "Mater Dei's Barkley national athlete of the year". Orange County Register. Archived from the original on July 21, 2008. ^ "Montana to award Barkley". Daily Pilot. December 27, 2007. Retrieved February 23, 2008. 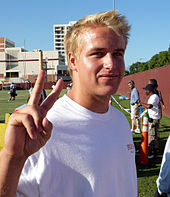 ^ Scott Schrader, Matt Barkley Commits To USC Archived April 12, 2008, at the Wayback Machine, WeAreSC.com, January 23, 2008, Accessed January 8, 2009. ^ a b c Scott Schrader, Barkley enrolling at USC next week Archived January 8, 2009, at the Wayback Machine, WeAreSC.com, January 6, 2009; accessed January 8, 2009. ^ "True freshman Barkley named USC starting QB". ESPN.com. August 27, 2009. Retrieved January 23, 2019. ^ "USC at California Box Score, October 3, 2009". College Football at Sports-Reference.com. Retrieved January 19, 2018. ^ "USC at Notre Dame Box Score, October 17, 2009". College Football at Sports-Reference.com. Retrieved January 19, 2018. ^ "Oregon State at Southern California Box Score, October 24, 2009". College Football at Sports-Reference.com. Retrieved January 19, 2018. ^ "Stanford at Southern California Box Score, November 14, 2009". College Football at Sports-Reference.com. Retrieved January 19, 2018. ^ "UCLA at Southern California Box Score, November 28, 2009". College Football at Sports-Reference.com. Retrieved January 19, 2018. ^ "Arizona at Southern California Box Score, December 5, 2009". College Football at Sports-Reference.com. Retrieved January 19, 2018. ^ "Emerald Bowl - USC vs Boston College Box Score, December 26, 2009". College Football at Sports-Reference.com. Retrieved January 19, 2018. ^ "USC at Hawaii Box Score, September 2, 2010". College Football at Sports-Reference.com. Retrieved January 19, 2018. ^ "USC vs. Hawai'i - Box Score - September 2, 2010". ESPN.com. Retrieved September 4, 2017. ^ Klein, Gary (September 9, 2010). 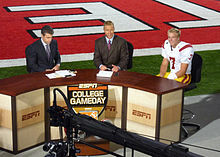 "USC's Matt Barkley doesn't mind being out of the limelight". Los Angeles Times. ISSN 0458-3035. Retrieved September 4, 2017. ^ "Minnesota at Southern California Box Score, September 3, 2011". College Football at Sports-Reference.com. Retrieved January 19, 2018. ^ "Arizona at Southern California Box Score, October 1, 2011". College Football at Sports-Reference.com. Retrieved January 19, 2018. ^ "USC at Colorado Box Score, November 4, 2011". College Football at Sports-Reference.com. Retrieved January 19, 2018. ^ "UCLA at Southern California Box Score, November 26, 2011". College Football at Sports-Reference.com. Retrieved January 19, 2018. ^ "Matt Barkley 2011 Game Log". College Football at Sports-Reference.com. Retrieved January 19, 2018. ^ "2011 USC Trojans Schedule and Results". College Football at Sports-Reference.com. Retrieved January 19, 2018. ^ "2011 Heisman Trophy Voting". College Football at Sports-Reference.com. Retrieved January 19, 2018. ^ "QB Barkley will return to USC for senior season". ESPN.com. December 22, 2011. Retrieved January 23, 2019. ^ Houston, Chris. "2012 Heisman Watch". cbssports.com. Retrieved January 12, 2013. ^ O'Connor, Kyle. 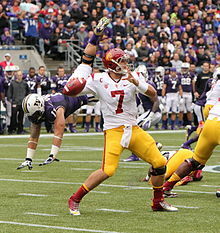 "Matt Barkley Heads List of 2012 Heisman Trophy Contenders". footballnation.com. Archived from the original on May 29, 2014. Retrieved January 12, 2013. ^ "Matt Barkley, No. 2 Trojans upset by Cardinal for fourth straight time". ESPN.com. Retrieved September 4, 2017. ^ "USC at UCLA Box Score, November 17, 2012". College Football at Sports-Reference.com. Retrieved January 19, 2018. ^ Pedro, Moura. "Career Over for USC's Matt Barkley". espn.go.com. Retrieved December 31, 2012. ^ "Dallas Cowboys at Philadelphia Eagles - October 20th, 2013". Pro-Football-Reference.com. Retrieved January 19, 2018. ^ "New York Giants at Philadelphia Eagles - October 27th, 2013". Pro-Football-Reference.com. Retrieved January 19, 2018. ^ "Watch Chicago Bears vs. Green Bay Packers [10/20/2016]". www.nfl.com. Retrieved September 4, 2017. ^ Campbell, Rich (December 4, 2016). "Adjustment in the snow helped Matt Barkley heat up in Bears win". chicagotribune.com. Retrieved December 9, 2016. ^ Krinch, Scott (December 4, 2016). "Bears' Matt Barkley 'showing the world' he can be a starting QB in the NFL". CSN Chicago. Retrieved December 9, 2016. ^ Williams, Charean (December 21, 2018). "Bills sign Matt Barkley to two-year extension". Pro Football Talk. NBC Sports. ^ "Samuel Barkley". USC Football Team Roster. Retrieved February 5, 2015. ^ "Matt Barkley". USC Football Team Roster. Retrieved February 5, 2015. ^ "Matt Barkley" (PDF). Matt Barkley Media Biography. Archived from the original (PDF) on February 6, 2015. Retrieved February 5, 2015. ^ "Catching Up With ... Brittany Langdon Barkley". Seattle Pacific University. July 11, 2014. Retrieved February 5, 2015. ^ Brittany Barkley [@barkleybritt] (December 21, 2014). "First comes love then comes marriage then comes a BABY with my amazing husband @MattBarkley" (Tweet) – via Twitter.